Who would've ever thought ten years ago, Marvel's red and gold Avenger would make the joke list of the Head of The White House? Or does he? Caught in the video footage below, President Obama confirms the Pentagon is helping to build Iron Man, and it's a project they've been working on for years. Then, like that episode of F.R.I.E.N.D.S. with Ross and Rachel, he takes it back. Give the brief video footage a look - and you be the judge. Should we be sending our C.V.'s for the position of War Machine to the White House? Just perfect. Charismatic as ever and even as a good joke it still makes you say hmmmmm. 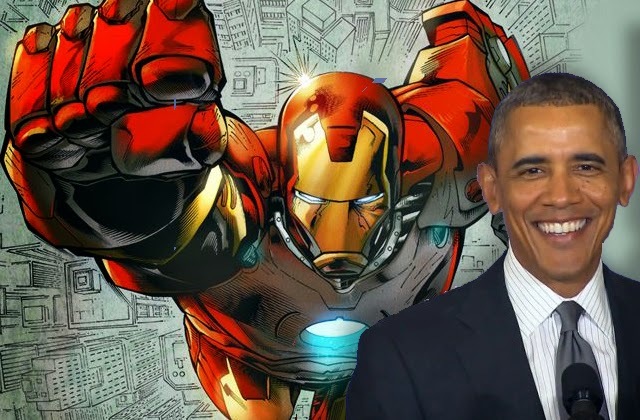 I think Obama should be concentrating on restoring the U.S. economy and making his absurdly complicated Obamacare work, rather than trying to make his own Iron Man. No wonder America's first black President is turning out to be a busted flush. Having said all that, his over-muscly wife Michelle could be the model for any Iron suit - shes got the shoulders at least.